To increase re-use of automated tests, it’s key to be able to separate dynamic data from static, non-changing code. It’s easy to understand why. Let’s say you have a test case that fills out a web form. Without separation of data, you would need to record one test for each set of data that needs to be tested. Data binding is a very powerful way to use data to record filling of forms. 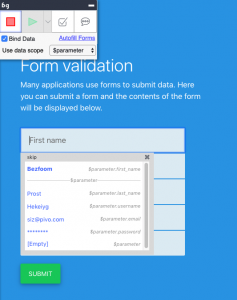 When a user is recording a form fill and “Bind data” is enabled, Boozang will look for matching data in the specified scope. For instance, when finding data key “first_name”, this will be suggested to be filled in the “First Name” field. It’s also possible to do the opposite. 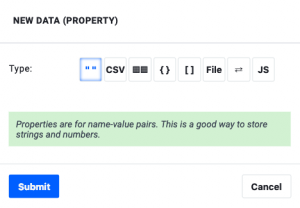 When recording a form fill, simply type the data into the form and click on the suggested key, and the data will be saved as JSON in the Boozang tool data tab. This allows users to create data-driven tests directly when recording, greatly adding to the re-usability of the test.